GEDCOM, an acronym for GEnealogical Data COMmunication, is a specification for exchanging genealogical data between different genealogy software. GEDCOM was developed by The Church of Jesus Christ of Latter-day Saints as an aid to genealogical research. A GEDCOM file is plain text (usually either ANSEL or ASCII) containing genealogical information about individuals, and meta data linking these records together. Most genealogy software supports importing from and/or exporting to GEDCOM format. However, some genealogy software programs incorporate the use of proprietary extensions to the GEDCOM format, which are not always recognized by other genealogy programs. The GEDCOM TestBook Project evaluates how well popular genealogy programs conform to the GEDCOM 5.5 standard. Additionally, many tools exist to convert GEDCOM files to HTML pages. Also, for additional information on GEDCOM, as it pertains to Geni, you can refer to the GEDCOM Overview page. You can export a GEDCOM of any Tree in your Forest from the Share page of your Tree tab. For more information see the GEDCOM Export page. Another form of GEDCOM Export is something one would need to perform with their offline family tree (from a genealogy program/software) if they would like to IMPORT their family tree onto Geni.com to either start a new account or to Import and Merge into an existing Geni.com tree (offline export for online import). An example would be if a Geni.com user has a family tree that was built using a common offline/desktop genealogy program or software package (i.e. Family Tree Maker, Legacy, etc) and wants to start a new family tree on Geni.com or add to his/her existing family tree on Geni.com but does not wish to manually enter all the names and wants to do IMPORT their offline tree and merge it with their online Geni.com family tree. Before attempting to Export a family tree from an offline or desktop genealogy program/software package, care should be given to the Export settings that one might have on their offline/desktop genealogy program. Many desktop/offline genealogy programs support UTF-8 so Geni.com decided to support it as well. When attempting to export your family tree from your offline/desktop genealogy program/software for the purpose of Importing it onto Geni.com one should follow the instructions on their offline genealogy program regarding "exporting family tree as a GEDCOM file" (usually an option on the main menu under FILE...next to "Save As" there should be an option to "Export" or "Export to GEDCOM"). When the "Export As GEDCOM" menu option is chosen, the user should then check the Export Settings and make sure that prior to exporting their offline tree and saving it as a GEDCOM for importing onto Geni.com, the options are set to the BEST POSSIBLE ones to make importing the GEDCOM onto Geni.com as seamless as possible (and to avoid thousands of duplicate files if duplicate profiles exists within the offline tree when compared to the Geni.com tree). By exporting your offline family tree with these settings you will ensure that as many data fields are saved as possible and remain intact after your family tree is imported onto Geni.com. All Geni users may export their files from the site using Blood Export, Ancestors or Descendants. However only Pro users may export their Forest from the site. You may do this from your GEDCOM page by selecting the appropriate file and then Export. Note that if you are using PAF software to read your file you may update the Type to export a PAF specific file. 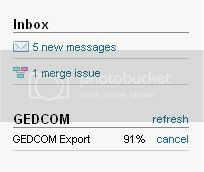 Pro Users may do a Single Click GEDCOM Forest Export and also recieve priority GEDCOM support for exported files from Geni. Note the Pro Export is limited to 100,000 profiles. Exported profiles contain all of the profile information entered on Geni for those individual profiles in your Family Group, those profiles you manage and the full public profile for those in your Forest. If the manager has updated their Settings, the public profile may contain limited information regarding that person and therefore a limited exported file. GEDCOM import is currently NOT possible. As administrator Monica Cruz explains, "In the past we allowed users to import GEDCOM files onto Geni. However, this caused a tremendous amount of duplicates and cleaning up the Big Tree became a tedious task. Therefore, we have disabled our GEDCOM importer feature indefinitely to prevent people from creating duplicate profiles. "You might first try searching for a Surname or our Public Directory to see if any of your relatives already have those people included in their tree. If they do, you can easily reach out to them and merge your tree with theirs. Once you are merged into their tree, those profiles will also be in your tree and you will be able to access/edit that information. "If their profiles are not yet on Geni, you will be required to enter those people on the tree manually." Go to the GEDCOM Import page (http://www.geni.com/gedcom/start). Fill out the form and upload your GEDCOM file. Indicate who you are in your file. Select any of the Options you would like to have included. Note: the only current option on the site is to include those NAME records in the Display Name field. This means that any NAME tag will be shown on the profile as the Display Name. Geni will import your GEDCOM file, for up to 50,000 profiles, and build your tree for you. Note that those profiles that fall outside of your Maximum Family Group will automatically be Shared Profiles. Your Maximum Family Group is your default Family Group including in-laws connected through ex's. You may view all the site definitions in our Glossary You can begin filling out your profile information right away. Once your GEDCOM has been processed and your Geni tree is built you will receive another email. Please Note: Importing a GEDCOM will create a new Geni Tree. If you already have a Geni account you must use a different email address for this import. This will start a new Tree which will not be merged into your existing Tree. We plan to enable GEDCOM Import into existing Trees in the future. For now see HOW TO: Merge your GEDCOM file(s) into your EXISTING tree for information about merging into an existing Tree. 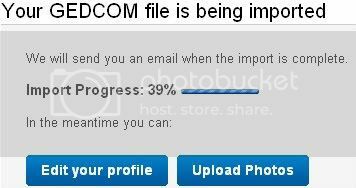 Currently we do not have the ability to upload a GEDCOM file directly to an existing account. However, we recently released some features that allow you to merge two existing trees into one. To begin the process, you will need to create a new GEDCOM account with a different email address other than the one associated with the existing account. Once you have uploaded your GEDCOM file, you may then add yourself (and the email address of the GEDCOM profile) to your existing tree and submit a merge request to your GEDCOM account. After you accept the merge request, the trees will then be merged and you will be prompted to resolve any conflicting data between the two trees. Resolving the data is a simple process of selecting the appropriate or correct information for any profiles with conflicts. We currently support GEDCOM version 5.5 and the ANSEL, ANSI, and UTF-8 character sets. Lots of GEDCOM files contain place information in PLAC fields. This field is copied directly into the place_name field in the address record. It doesn't populate the address fields (city, state, country, ...). If you want the address fields populated, you need to make sure your GEDCOM file contains ADDR structures instead. Please feel free to update this issue with instructions on how to do this in various genealogy programs if you know how. Currently geocoding is done by city, state, country. I'm creating an enhancement ticket to have it geocode by place_name if those fields are empty. but seem to be in common use. Places will appear not to import if you're GEDCOM uses a PLAC field instead of an ADDR structure. The PLAC field is copied into a place_name field in our system which is currently not exposed for editing, but should be soon. This page was last modified on 5 March 2015, at 07:13. This page has been accessed 128,731 times.